One of the biggest reasons that cruising has become so popular over the past few decades is because it offers tremendous value. Say you wanted to go to the Caribbean and do a little island hopping. You’ve have to pay for flights, hotels, meals, entertainment, and more. With a cruise, everything you need is included in one price. And because of the scale of cruise ships, you are able to buy an island getaway for hundreds — or even thousands — less than it would cost to put together the trip on your own. For example, we’ve seen week-long vacations for $500 or less per person. It’s simply an unrivaled value. Of course, this isn’t lost on cruise passengers. It’s one of the reasons more than 11 million people sail from North America each year… and the number continues to grow. But all too often we hear some people say that they can’t afford to go on a cruise because they think it’s too expensive. What we’ve found is that even if you don’t have the cash to go on a cruise right now, it actually takes only a small amount of regular saving to quickly pay for your trip. To give you a better idea, we’ve rounded up some everyday expenses and compared them to the cost of a cruise. We hope this will show you how affordable cruising can be (or as you’ll see, how expensive college has become)! According to NBC News, the average monthly cable bill is now a record $99 per month. Over the course of a year, that means you’ll pay $1,188 per year… often on channels you never watch. With that much money, you would have a ton of options. We found a 7-day cruise aboard Royal Caribbean’s Harmony of the Seas, leaving from Fort Lauderdale, Florida. This particular ship sails in October 2017, visiting St. Thomas, Puerto Rico, and Royal Caribbean’s private port in Labadee, Haiti. The cost for an interior room is $876, but an upgraded balcony room is listed at $1,096 per person. A recent Zagat survey showed that people spend an average of $39.40 per person when they eat dinner out. We would never suggest stopping eating out entirely (nor could we do that! ), but consider that if you eat out once a week for a year, that $39.40 per meal turns into more than $2,000. Cruising to Alaska is on many people’s bucket list. For a little over $2K, you could cross it off your list… twice. Norwegian offers a 7-night Alaskan cruise that departs Seattle, stopping in Juneau, Skagway, Ketchikan, and Victoria, British Columbia before returning. The trip is just $994 in early June for an interior cabin, and $1,044 for the same trip again just one week later. That’s two weeks of cruising you’ll never forget. There’s cruising… and then there is cruising in a suite. Sure you can have a handbag, or you could take a trip on the Carnival Victory next August, sailing from Miami, with stops in Cozumel and Key West… and taking in the trip from the comfort of a top-end suite. Best of all, if you aren’t the sort of person who needs a fancy cabin, then an interior room for the same trip is as little as $254 per night. At that price, you could pay for excursions and drinks while still having money left over. It’s well known how much that cup of coffee from Starbucks can add up to be over the long term. A $3.45 tall Caffe Mocha every other day turns into $621 per year. And yes, that’s more than enough to take a cruise. Even a few dollars per day is enough to go on a great cruise. Carnival offers a 7-night sailing from Galveston aboard the Carnival Breeze for just $669 in January. 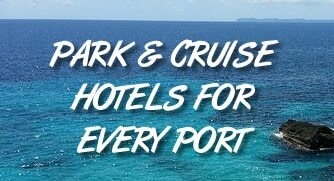 This trip includes a balcony room with stops in Roatan, Belize City, and Cozumel. We’re not saying to give up your morning coffee to go on this cruise — we could never do that. But it goes to show that even small amounts of money set aside can get you cruising in no time. We all know that car payments are a huge chunk of our budget. According to a recent Bankrate.com article, the typical car payment is now a staggering $459 per month or more than $5,500 per year. We all need transportation, but we’d much rather be transported on a cruise ship. For most people, a weeklong vacation is a big deal. With cruising, you can sail for nearly three weeks and still have money left over when compared to the average car payment over a year. This cruise from Princess is roundtrip from Fort Lauderdale. It includes stops in 12 exotic Caribbean ports, including St. Thomas, Barbados, and Bonaire. Best of all, you can spread out a little by booking this cruise in a suite. We wouldn’t expect people to skip a year of college to take a cruise, but we do think comparing the two help to show how affordable cruising it… or how unaffordable college has become. According to CollegeBoard.org, in-state tuition and fees for a single year at a 4-year public school has soared to $9,410. What would that get you on a cruise? This cruise would be the sailing of a lifetime. It’s basically a 50-night around the world trip. The sailing starts in Hong Kong. Don’t worry about getting there as you could buy a one-way plane ticket to there and still come in less than a year’s worth of tuition. From Hong Kong this trip sails to Vietnam, Thailand, and Singapore, before heading to Sri Lanka, circling the African continent and hitting Brazil before finishing in Fort Lauderdale. Frankly, you’re more likely to remember this trip than you are to remember that random Psychology class you took your sophomore year.